Congratulations RKMS! 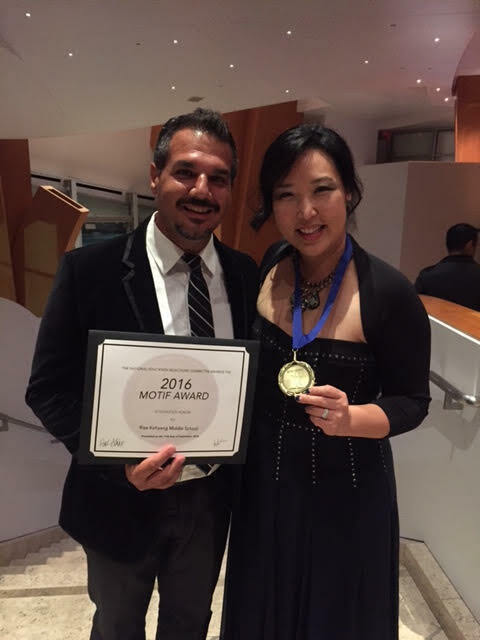 We received the Motif Award on September 11th at the Walt Disney Concert Hall! Thank you teachers for helping all of us out and trying your best. For those who don’t know about the Motif Award, here is an explanation below. Ms. Kim, our 6th Grade ELA teacher, was also present when Ms. KimLy received the award. “When RKMS got this prize, I felt very proud of our school for all its accomplishments. Our students put in a lot of work when advocating for themselves, their school and their community. It’s nice to be recognized for something we believe in. Let’s keep it up RKMS! Thank you teachers for helping us learn about ourselves and for giving back to the school and, last but not least, our community. If you’d like to congratulate RKMS, post a comment below! 축하합니다. 정말 자랑스럽네요. 너무 멋져요~~! !